Intel has unveiled a 48-core chip the size of a postage stamp – with the prototype "single-chip cloud computer" packing in a whopping 1.3 billion transistors. Intel's SCC could lead to more energy efficient data-centres – with the chip consuming only as much electricity as two standard household light bulbs. Justin Rattner, Head of Intel Labs and Intel's Chief Technology Officer: "With a chip like this, you could imagine a cloud datacenter of the future which will be an order of magnitude more energy efficient than what exists today, saving significant resources on space and power costs. "Over time, I expect these advanced concepts to find their way into mainstream devices, just as advanced automotive technology such as electronic engine control, air bags and anti-lock braking eventually found their way into all cars." 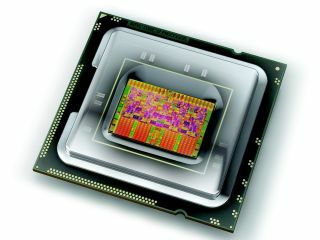 The name single-chip cloud computer is a reference to the way the chip can handle large tasks and big amounts of data by distributing them across several cores. This parallel processing partly mimics the way in which datacenters – comprising hundreds of individual computers rather than cores on a chip – deal with things like social networking and online banking. The chip from Intel is part of a long-term research project which will see the main new developments drafted into Intel's Core chips in the coming year, and more than 100 SCC prototype chips handed out to academia and research centres to developing apps and programming models. Intel is due to bring out hexa-core and eight core chips in 2010, with the company's quad core chips like the i7 proving a major success.